My great great great grandparents John and Helen Carnegie are buried in the only surviving grave in the old Toorbul cemetery, now a historic reserve. I have found all types of records about the family and their oyster leases in Pumicestone Passage after they settled there in the 1870s. When I started researching the family history in the late 1970s, local historian Stan Tutt gave me some photos he had taken of the family home at Toorbul which he said was referred to as Karisma. I have since found Karisma on many records relating to the Carnegie family and to their daughter Clara Stanley Davis later Bishop. When talking about my family at the local Bribie Island Historical Society, I mentioned that Karissma (sic) Street and other Karisma references at Toorbul were possibly because of the old Carnegie home, Karisma. It was pointed out that there was a boat by that name too in the area but that seemed to be much later than my family’s home. So I am not convinced that these Karisma references do not refer to my family, it seems too coincidental and their home was there long before the boat. So what do we do when we are not sure about something? We search Trove and sometimes we find answers and then maybe not. What I have found this Trove Tuesday is an article in the Sunday Mail, 23 November 1952 about Karisma Estate which went on sale in November 1952. 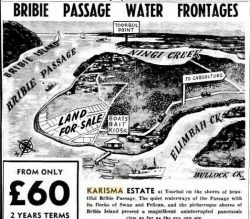 The estate was located at the Elimbah Creek side of Toorbul and the Carnegie home and oyster leases were on the opposite side bordering Ningi Creek. Not a great distance away and a nice easy walk on a fine day. 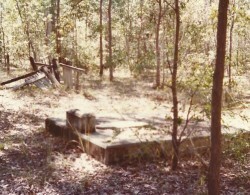 According to Stan Tutt, Karisma (the family home) was not demolished until the early 1970s. There is nothing in the newspaper article that suggests where the developers got the name Karisma from, but Clara Stanley Bishop lived in the old family home until her death in 1960. Another search of Trove revealed that Clara rented out the family home in the 1920s. The Brisbane Courier on 13 September 1926 had an advertisement for ‘home from home, on seaside farm, moderate tariff’ placed by C S Bishop. John and Helen Carnegie both died in the 1900s so the family home was still being referred to as Karisma over 20 years after their deaths. Another advertisement in the Courier Mail on 8 May 1939 was for the rental of a butcher shop on Bribie Island. It was placed by G E Bishop, Clara’s husband and the address was Karisma, Toorbul. This indicated that Clara and George moved into the family home some time after 1926 when they were trying to rent it. While I have not found anything that definitely proves that the local Karisma references were named after the old Carnegie home, I still think that it would be too much of a coincidence to say that there is no connection. Possibly the boat was named after the family home but I have not researched the boat and I don’t even know who it belonged to. Something else to follow up another time. Thanks Trove for giving me more information on the old Carnegie home, Karisma at Toorbul. Thanks Chris. There are so many little stories about our ancestors in Trove. I just love the inspiration of Trove Tuesday.